This article is to help new members of my free Facebook group – Thetesttaker, get the most of it and primarily help them to prepare for IELTS Speaking test. 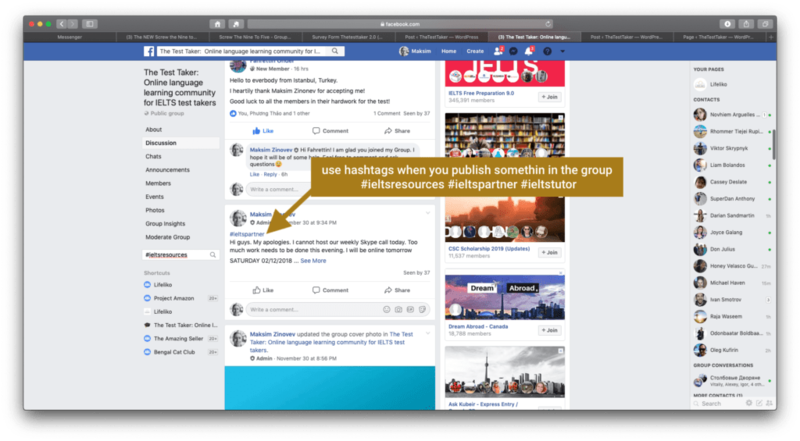 There are also some rules and best practices to make it a place where you could easily find answers to your questions, share content and and make friends. Please read them before you get started actively using the group. Be the kind of supportive friend that you want and need on your entrepreneurial journey. Do you need speaking partner to practice and prepare for IELTS? Ask any question or share your experience regarding IELTS practice with other people like you using tag #SPEAKINGPARTNER. ”#IELTSPARTNER Anybody want to practice once a week with me? I am intermediate level speaker. My exam is next month”. Do you look for IELTS tutor/teacher/trainer? Ask any question or share your experience using tag #IELTSTUTOR: how to find, where is the best places, how to find affordable classes, etc. ”#IELTSTUTOR Do you have IELTS tutor? Where I can find one for myself?”. Do you need really useful resources for IELTS Speaking preparation (or even other parts of exam)? Ask any question or share something useful regarding IELTS Speaking resources using tag #IELTSRESOURCES . ”#IELTSRECOURCES I need sample questions and topic vocabulary about Technology to prepare for IELTS Speaking test. Where I can find them?”. For IELTS speaking resources please feel free to visit: https://thetesttaker.com/topic. By joining this group, you agree that you have read and will follow the rules and guidelines set for this online community. This group is exclusively for anyone who is aiming for a high score in the IELTS Speaking Test. This group is created as a platform for sharing IELTS Speaking resources It also helps IELTS students from different countries connect and help each other practice spoken English and prepare for IELTS speaking test. Please feel free to add your friends who you feel would benefit from joining. Please don’t forget to make/share/comment on posts. A lot can be achieved with a sharing community! 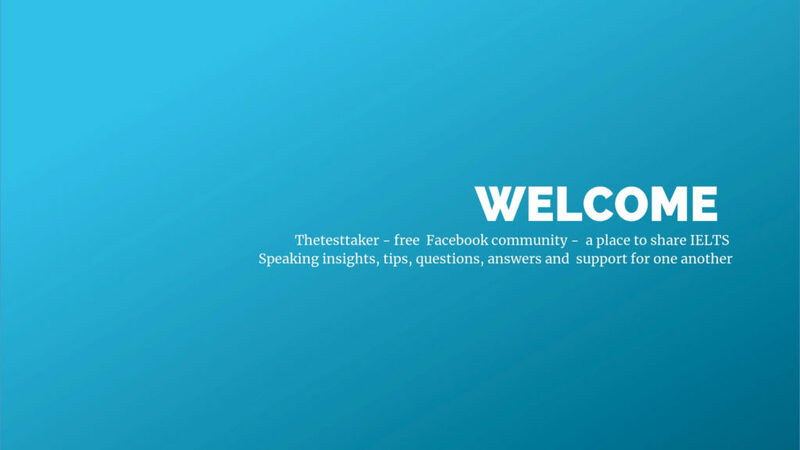 I, Maksim Zinovev is the admin of this group and the man behind thetesttaker.com. If you have any question, feel free to contact me. Please read carefully and follow the rules. 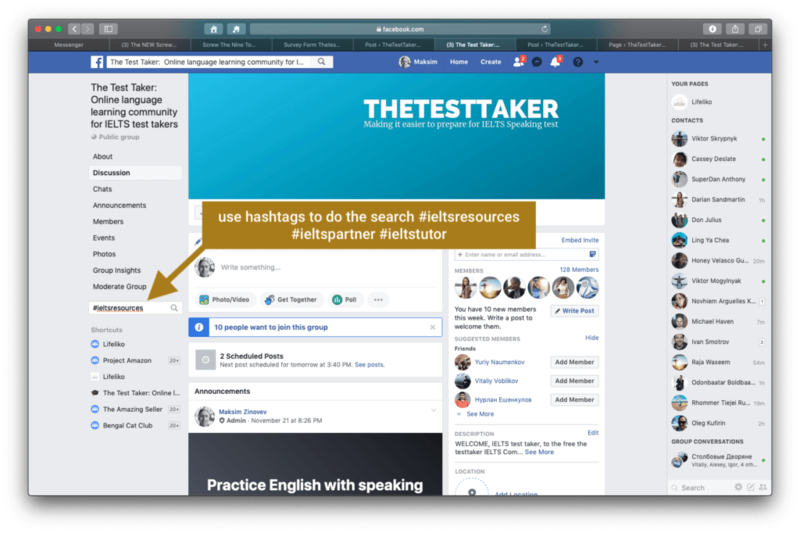 You can also find them on the About page: https://www.facebook.com/groups/thetesttaker/about/ . Any members (self)promotional or dubious (cross)posts/links/comments/requests/offers will be removed, unless first pre-approved by admins (admins’ materials are excluded from this rule). This includes free and affiliate/paid links (including shorten links), jobs and promotions, etc.